Spur gears are the most common type of gears used in industry and they have straight, flat-topped teeth set parallel to the shaft. 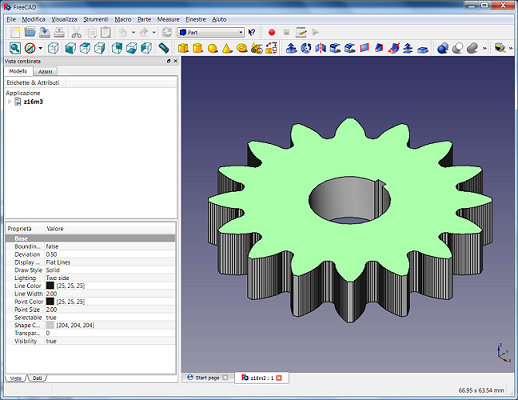 return a DXF file containing the 2D profile of the gear to be used with 2D and 3D CAD software. the face width b of the tooth. For standard gears, the pressure angle α is 20°, the coefficient of fillet radius of the rack cutter R/m is equal to 0.38 (type A basic rack tooth profile - ISO 53:1998) and the rack shift coefficient x/m is 0. 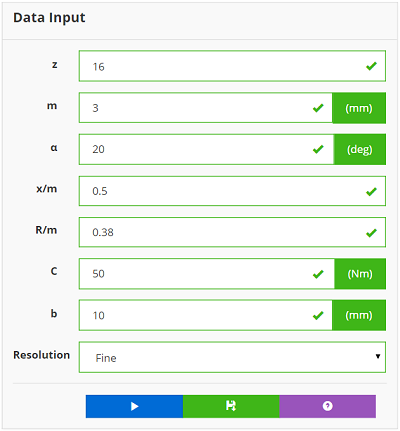 Set afterwards the Resolution - Coarse, Medium or Fine - and click on the "Run" button . 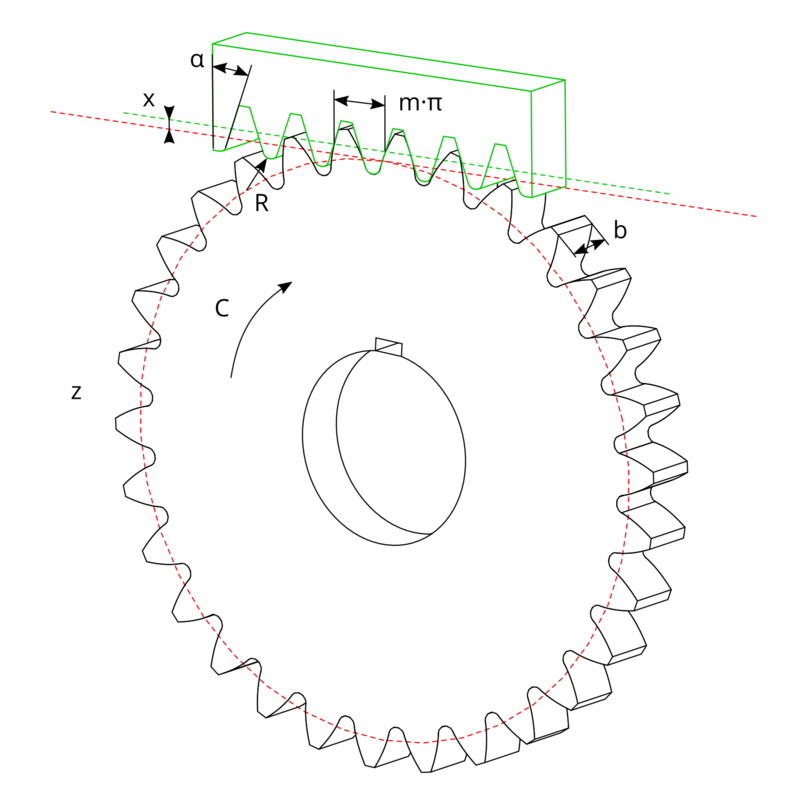 If there is no undercut, the software calculates the tooth root bending stress using the Lewis method, provides the geometric parameters of the gear and generates the DXF profile of the gear where the tooth profile is the true involute curve and the base radius is the true trochoid curve. where YL is the form factor which takes into account the influence of the tooth form. The tooth root bending stress σF doesn't take into account variation due to applied torque, dynamic effects, inaccuracies in manufacture, elastic deformations, geometric tolerances, local stress effects due to the change of section at the tooth root, rimmed gears, etc. To download the DXF profile of the gear, click on the "Download DXF Profile" button and use it with your favourite CAD software. For the meaning of the terms used in the software and for additional information regarding spur gears, click on the "Spur Gears Help" button . Warning! There is an undercut! Well done! 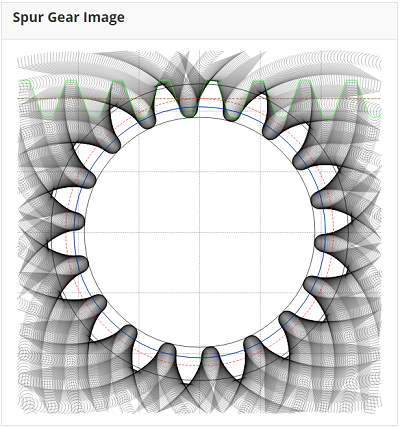 You successfully create your spur gear! with the number of teeth equal to 18 - the minimum number to not have geometric undercut effects. The gear has a face-width of 10 mm and a 50 Nm static torque is applied. Here below are the input data and the corresponding image of the gear created clicking the "Run" button . Consider to create the same gear of the Example #1 but with the number of teeth equal to 16. To do this it's necessary to correct the tooth of the gear using a shift coefficient x/m = +0.5. Here below are the input data and the corresponding gear created with a 3D cad software using the downloaded DXF profile. Try to reduce R/m parameter!